Massage therapy is commonly viewed as a treatment option for patients with a wide range of somatic abnormalities from Headache to the Plantar Fasciitis. However, medical massage is an excellent clinical tool for the treatment of various visceral disorders as well. If for many somatic abnormalities the correct medical massage protocol is a solution, in cases of visceral disorders the medical massage is also an important clinical tool that physicians can use to optimize the patient’s treatment. Thus, medical massage becomes part of an integrative approach to the treatment of various visceral disorders. This is the first part of an article in which we discuss the treatment of pneumonia using medical massage. The article is a simplified version of part of the excellent textbook, Medical Massage for Pneumonia written by Dr. T.V. Mitichkina from Novokuznetsk Medical University in Russia. Currently, this textbook is used for the continued education of physicians and interns who specialized in clinical rehabilitation. The main goal of this and similar textbooks is to teach physicians how to prescribe medical massage and control its execution by massage practitioners. One of the goals of this article is to demonstrate to readers how much research and clinical experience is behind the medical massage concept and to show new directions in which practitioners may grow. After you finish the article, we would like you to pause for a second and appreciate the fact that this textbook is written as continuing educational material for pulmonologists and physiatrists and is currently used as a main educational source for physicians. While practitioners in the United States and other Western countries object to the limited use of medical massage by traditional medicine, in many Eastern European countries physicians study medical massage in medical school and as a continuing-education subject to better understand massage protocols and assist massage practitioners in formulating individual treatments for each patient. Also, we would like to emphasize that the content of Dr. Mitichkina’s entire textbook is dedicated to one(!) disease – pneumonia. Medical massage has the great therapeutic impact on abnormalities of the pulmonary system. The main reason for this is the fact that various somatic structures are the main driving force for the normal function of the respiratory system. If these structures are failing the entire respiratory cycle is affected and, as result, respiratory abnormality progresses. Each disorder of the respiratory system requires a unique protocol of medical massage. Thus, the treatment plan for a patient with emphysema differs from the protocol used for the treatment of a patient with pneumonia. This article discusses the medical massage therapy in cases of pneumonia. Overall, the clinical application of massage for patients with pneumonia has two goals. The first goal of the treatment protocol is the application of the percussion techniques that target pulmonary drainage in combination with therapeutic massage. Application of the percussion techniques on the thoracic cage while the patient’s body is placed in special positions allows the practitioner to efficiently drain sputum from each lobe separately and clear the respiratory pathways. This is a critical component of the therapy for patients with pneumonia since the accumulation of sputum in the respiratory pathways delays resolution of inflammatory foci in the lung which are perfect breeding ground for microorganisms that caused pneumonia. The second goal is to use the combination of percussion techniques and the Segment-Reflex Massage. In these cases, the practitioner targets pulmonary inflammation by employing the viscera-somatic and viscera-motor spinal reflexes. These reflexes link different parts of the lung with the skin, fascia, skeletal muscles and periosteum (i.e., thin connective tissue membrane that covers bones) that share innervation from the same segments of the spinal cord. This issue requires a special discussion since this article is a theoretical foundation for the application of massage therapy as integrative part of rehabilitation of patients with any visceral disorder especially pulmonary abnormalities. During the earliest stages of development, the embryo consists of three major parts: ectoderm, mesoderm and endoderm. Future development of the embryo requires a complicated process of maturation and differentiation of the original cells, as well as organs and tissues that originate from them. During these processes, tissue and organs undergo transformations while they migrate along the embryo or fetus. For example, cell precursors of latissimus dorsi muscle originally are located in the cervical area of the embryo and during its maturation migrated to the middle section of the embryo giving the origin of the latissimus dorsi. Considering such complicated relationships, the only anatomical structure which maintains consistency and order is CNS especially the spinal cord, which has a segmental structure. Overall we have 8 cervical, 12, thoracic, 5 lumbar and 4-5 coccygeal segments in the spinal cord. Such an arrangement allows the body to efficiently manage all body functions without unnecessarily overwhelming the brain with extraneous information. 2. 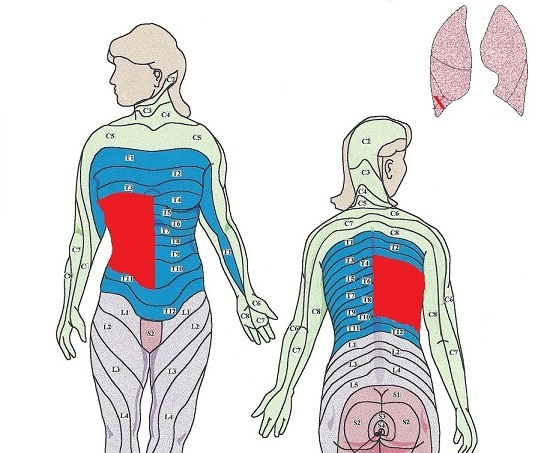 Dermatome – the strip of the skin innervated by this segment of the spinal cord (see Fig. 1). Be aware of the overlapping phenomenon for dermatomes innervation. For example, the C6 segment of the spinal cord gives 50% innervation to C6 dermatome while also giving 25% innervation to each C5 and C7 dermatomes. Thus, 50% of C6 dermatome innervation comes from C6 segment of the spinal cord while 25% comes from the upper C5 segment of the spinal cord and 25% comes from C7 segment of the spinal cord. As we discussed above, medical massage treatment has two major applications for patients with pneumonia: The therapeutic action of medical massage and Segment Reflex Massage or similar modalities. 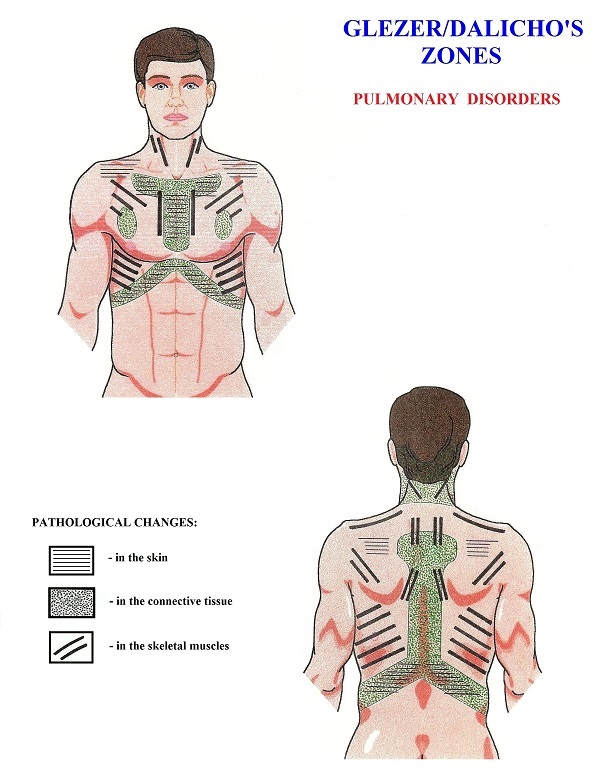 Anyone desiring to successfully practice medical massage as part of pulmonary rehabilitation must be familiar with the map of dermatomes (see Fig. 1), which are strips of the skin innervated by the different segments of the spinal cord. 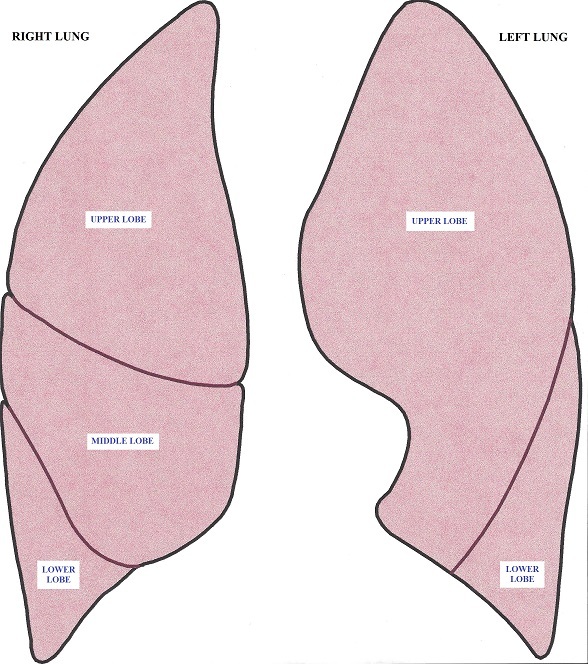 Another important piece of information is the anatomical structure of the lungs: The right lung has three lobes (upper, middle and lower) while the left lung has two lobes (upper and lower) (see Fig. 2). Each part of the lung shares the innervation with matching dermatomes, myotomes, and sclerotomes, and by knowing this pattern of common innervation, the practitioner may affect the pulmonary function by stimulating the soft tissue using viscro-somatic and viscra-motor reflexes. These diagrams indicate areas of priority massage for the various localizations of the inflammatory process in the lungs. Thus, the practitioner must communicate with the patient’s family physician or pulmonologist to obtain critical medical information: i.e., where exactly pulmonary inflammation is located, and match this information with diagrams presented in Fig. 3. This is a first critical step in formulating a correct medical massage protocol for patients with pulmonary abnormalities including pneumonia. By matching the location of the process with diagrams presented in Fig. 3, it is immediately obvious which parts of the body should be addressed first and the most during the treatment session. The best outcomes of massage treatment are obtained when impulses that are generated during the stimulation of the soft tissues arrive as soon as possible to the segments of the spinal cord responsible for the innervation of the dermatomes and affected part of the lung. 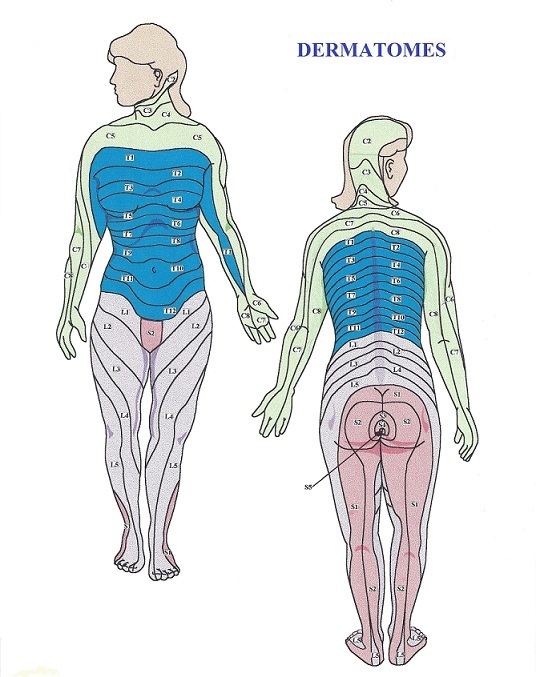 Since the dorsal (i.e., posterior) parts of the involved dermatomes and lateral sides are closer to the spinal cord these areas within priority areas must be stimulated first and for the longer time while ventral (i.e., anterior) parts of the priority areas should be involved in the treatment later. The concept of Segment-Reflex Massage was developed by Dr. O. Glezer and Dr. V.A. Dalicho and published in 1955 in the classic textbook Segment-Reflex Massage. This highly effective method of somatic rehabilitation grew from the basic concept of therapeutic massage rehabilitation for patients with various visceral abnormalities including pulmonary disorders. The main difference in Segment- Reflex Massage is prevention of reflex zones formation or their methodical elimination on a layer-by-layer basis in skin, fascia, skeletal muscles and periosteum. Dr. Glezer and Dr. Dalicho conducted countless clinical observations and developed the Glezer/Dalicho zones, which reflect the most likely patterns of reflex zones distribution in cases of various somatic and visceral abnormalities. 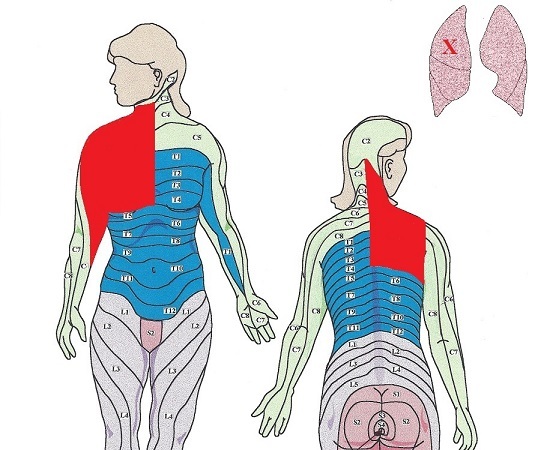 Fig.4 presents the Glezer/Dalicho zones for pulmonary disorders. The diagram indicates the most common pattern of abnormalities that may form in the skin, fascia and skeletal muscles in patients with pulmonary disorders. The publication of these zones for each system of the human body is one of the greatest achievements in the science of manual therapy and medical massage. The issue of reflex zones formation requires a separate discussion since this subject is critically important for everyone who practices medical massage in cases of visceral disorders. Let us say that the patient suffers from chronic pneumonia for three weeks. During this time, the patient coughs, feels chest pain, has sputum discharge, experiences breathing difficulties, etc. These symptoms are signs that body is trying to fight the original pathological process. For example, the cough is the body’s effort to clear the bronchial tree from sputum formed there. For the cough to start the receptors inside, the bronchial tree must be stimulated by the accumulated sputum and send sensory information to the spinal cord that forms the motor response to activate the respiratory muscles, diaphragm and smooth muscles inside the bronchial walls to contract and eventually drain sputum during cough. If these events continue in the patient’s body for at least a couple weeks, the pathological changes in the form of reflex zones start to develop in the soft tissue that share the same innervation with the affected parts of the lungs, i.e. within borders of affected dermatomes, myotomes and sclerotomes. Let us re-create the chain of events responsible for the formation of reflex zones in the soft tissues on the example of a patient with right-side, middle-lobar pneumonia. First of all, let us get familiar with major players involved in this process with the help of Fig. 5. Now we will bring entire process to life with the help of the interactive diagram presented in Fig. 6. To replay the diagram please click at the beginning of the sliding bar (blue line) located just below the diagram. Since early stages of pulmonary abnormality, the sensory stimulation evoked by the original pathological process bombards the segments of the spinal cord that are responsible for the innervation of the middle lobe of the right lung. This process is indicated by the FIRST BLUE DOT moving along the ascending or afferent nervous pathway from the lungs to the posterior horns of the spinal cord where this information is initially processed. 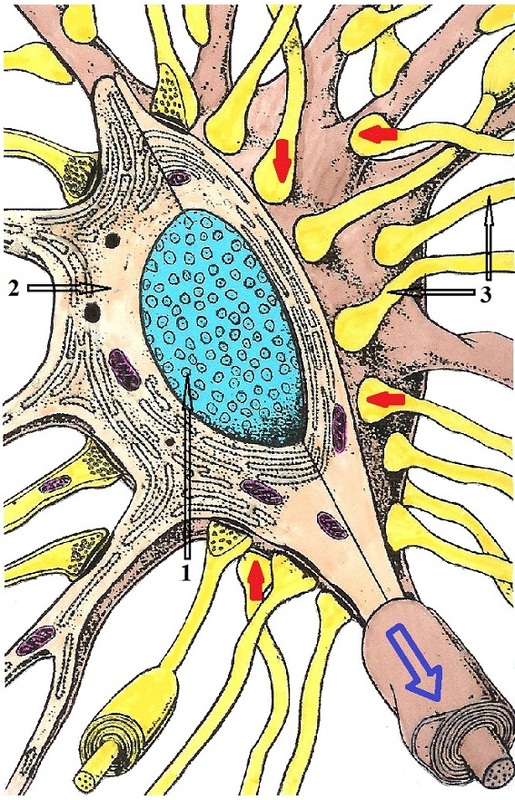 The posterior horns of the spinal cord work as a sensory computer that analyzes initial input from the stimulated peripheral receptors and conducts this information to the different parts of CNS. From posterior horns the sensory stimuli travel in two directions within CNS. The movement of the FIRST GREEN DOT indicates that the ascending information now continues to move up to the brain via spinothalamic tract creating in the patient the unpleasant sensations of cough, labored breathing, etc. This is the body’s primary protective reaction. Since the patient feels uncomfortable sensations, he or she refrains from exposure to low temperatures, excessive physical work and starts to seek medical help by contacting a family physician or pulmonologist. Thus, further ascending of sensory stimuli within CNS will change the patient’s behavior to help the body fight more efficiently against the infection. The movement of the SECOND GREEN DOT indicates conductance of the sensory stimuli within the segment of the spinal cord from the posterior horns of the spinal cord to the anterior horns via intermediate neuron that connects these two centers. If the posterior horns of the spinal cord are the computer that analyzes the sensory input from the peripheral receptors, the anterior horns of the spinal cord are the lower motor command centers that are responsible for the generation of motor commands back to the stimulated area. Thus, the lower motor centers are located in the anterior horns of the spinal cord. If, for example, one touches a very hot stove, the sensory stimulation of the temperature and pain receptors in the fingertips triggers an immediate motor response to high temperature in the form of the withdrawal reflex. This process happens without involvement of the upper echelons of CNS since one does not discuss if he or she needs to withdraw the hand from the hot stove. In the discussed case of pneumonia, the sensory stimuli reports to the CNS the accumulation of the sputum inside the bronchial tree and it triggers the motor response in the form of cough, again without involvement of the upper level of CNS. Thus, as soon as the anterior horns of the spinal cord are activated by the sensory stimulation which arrived via the intermediate neuron, they form a flow of motor commands back to the parts of the body where the initial sensory stimulation happened (accumulation of sputum – cough). This process is indicated by the movement of the FIRST RED DOT back to the lungs along the descending or efferent nervous pathways. The lower motor centers in the anterior horns are unable to distinguish where they send motor innervation to because of the so-called phenomenon of convergence, which we will discuss below. As soon as lower motor centers are activated they send motor commands to every organ or tissue this segment of the spinal cord innervates. Thus, the motor commands which were delivered to the lungs (e.g. contraction of smooth muscles of the bronchial tree to clear out the sputum) also sent to the soft tissues which are innervated by the same segment of the spinal cord as affected part of the lung. This process is shown as a SECOND RED DOT which travels from the lower motor centers located in the anterior horns of the spinal cord to the skin, connective tissue structures, skeletal muscles and periosteum. At this point soft tissues that are innervated by the same segment of the spinal cord as the affected part of the lungs start to receive motor stimuli but these stimuli are unneeded since there is no initial sensory stimulation of the peripheral receptors in the soft tissue that now receives additional motor stimuli. 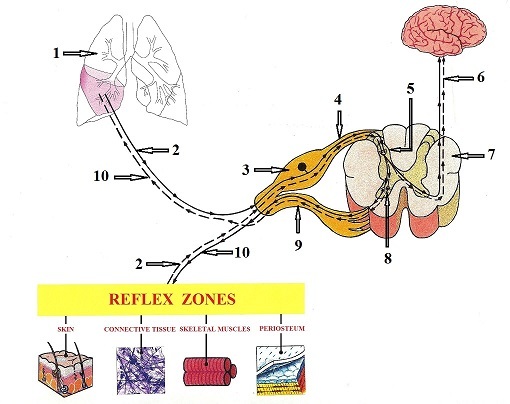 After some period of such additional stimulation, various pathological abnormalities in the form of reflex zones start to develop in the soft tissue that shares the same innervation with affected parts of the lungs. These abnormalities manifest as tingling or burning pain in the skin, muscle tension or pain and tension in the periosteum, etc. As soon as reflex zones are formed in the soft tissue, the peripheral receptors there start to emit their own sensory stimuli to the same segment of the spinal cord, (shown as SECOND BLUE DOT in Fig. 5) which travel from the areas of reflex zones to the posterior horns of the spinal cord. As soon as the posterior horns are stimulated, they send information to the upper echelons of CNS (THIRD GREEN DOT travels to the brain) and the patient starts to feel the sensation of tension and, at the same time, the sensory stimuli are conducted via the intermediate neuron to the lower motor centers located in the anterior horns (FORTH GREEN DOT travels to the anterior horns). 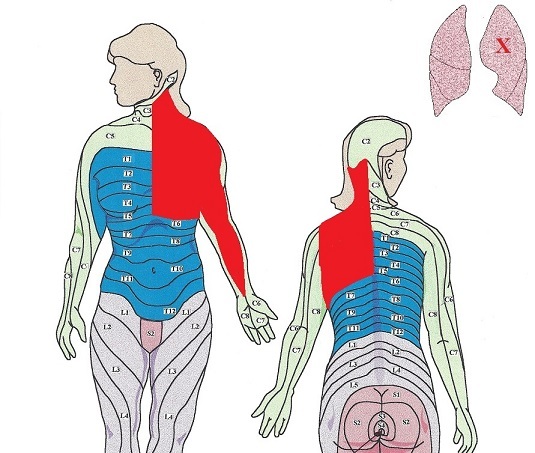 As soon as the lower motor centers are activated, they send the motor response back to the stimulated soft tissue (THIRD RED DOT) but, at the same time, these motor commands are conducted to the affected areas of the lungs (FOURTH RED DOT) and additionally irritates inflamed areas. Thus, reflex zones in the soft tissue become an additional factor, which further contributes to the fueling of the original clinical picture of pneumonia. Thus, it is the practitioner’s job to prevent the formation of reflex zones using therapeutic massage or eliminate them if they form using Segment-Reflex Massage or other modalities designed for the treatment of chronic visceral abnormalities. The final subject of this article is the phenomenon of convergence: Why the chronic visceral abnormalities are responsible for the formation of the reflex zones in the soft tissue and how reflex zones when formed contribute to the further development of the original pathological process in the affected inner organ? Please look on Fig. 7 that shows the structure of the spinal neuron located in the posterior horns of the spinal cord. This is a picture of one of the sensory computers located there. Because the posterior horns are a relatively small part of the spinal cord, there is no way each spinal neuron will contact with peripheral receptors from one small part of the body or one type of tissue. Simply put, there is no room to do that. This is why several ascending sensory pathways that deliver information from the peripheral receptors to the spinal cord land on the body of the same spinal neuron. If we continue to use our patient with right-side, middle-lobar pneumonia as an example, we may see that sensory fibers from different organs and tissues land on the body of the same spinal neuron. In such case, the spinal neuron will be equally stimulated by impulses from the lungs and from, let us say, the skeletal muscles. Each of these stimulations will in equal degree activate the lower motor neurons. Their activation will send motor commands to all tissues and inner organs innervated by the same segment of the spinal cord thus forming a vicious cycle of codependent pathologies. The longer the symptoms of pneumonia are present, the more reflex zones develop in the soft tissue, which contribute to the further maintenance of pulmonary inflammation. Dr. Mitichkina graduated from Tomsk Medical School in Russia in 1984. In 1990, she completed her residential program at the Novokuznetsk State Institute of Postgraduate Medicine; Department of Rehabilitation Medicine with a specialization in manual therapy and reflexotherapy. In the 1990s, she worked as a neurologist and later as chief of the rehabilitation department of City Hospital #5 of Novokuznetsk. Currently, Dr. Mitichkina is involved in several scientific studies and teaches rehabilitation medicine to physicians who practice in this field of medicine. In addition, she is a practicing neurologist. Dr. Mitichkina is the author of 30 scientific papers and holds one patent in Russia. She is married and has two sons. Her hobbies are classical music and travel.